NEWINGTON - It’s been a few months since the town snagged a slice of the axe-throwing pie, but unbeknownst to those who have yet to step inside Montana Nights, this pie is a new recipe. In fact, it’s swinging to win the state fair. 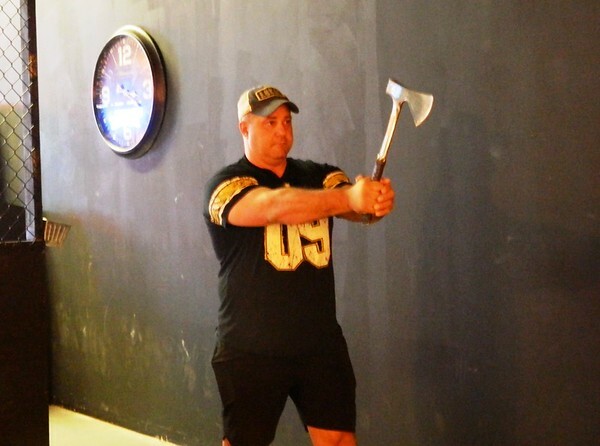 The facility at 80 Fenn Road opened in mid-August, a few weeks after Blue Ox Axe Throwing in Wallingford and two months after Pine & Iron in Hartford - the first of the three to introduce this Canadian pastime to Connecticut. 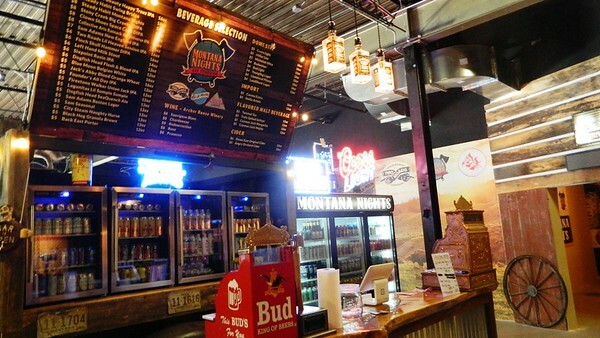 Montana Nights Axe Throwing has gained the most attention, setting itself apart as the largest venue of its kind in New England, at just under 8,000 square feet. Rustic charm has sprouted up here like the Ponderosa Pine, hand-picked by Owner and Montana fanatic Merle Mackenzie. He’s been to big sky country three times and can’t wait to take another trip. The former industrial warehouse has embraced a new tavern-like feel with a pool table, reclaimed wood coffee tables, giant artwork depicting rural family life, and sturdy, worn-leather arm chairs. 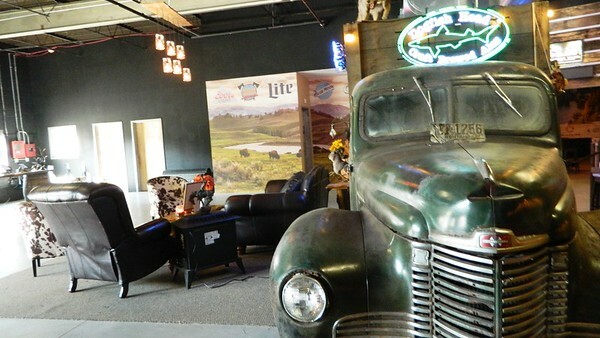 The crowning jewel of the space is a green, 1946 International Harvester pickup Mackenzie found in Montana and refurbished into a bar. Here, customers over age 21 can grab a Swing Bridge IPA from the Haddam-based Steady Habit Brewing Co. or another one of 50-plus varieties of craft beers and wines. 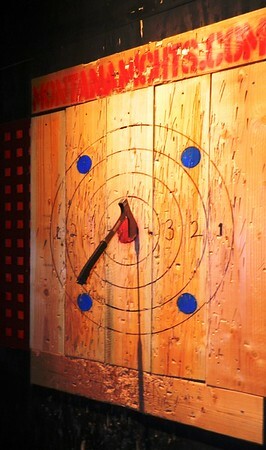 This is the only one of Connecticut’s three axe-throwing venues to obtain an alcohol permit thus far. Mackenzie, who lives in Higganum, chose to open his business in Newington for several reasons. “It’s easily accessible, there’s a college nearby and there’s a million people in the region within a small radius,” he said. Area residents have already come to see what’s up. Among them, staff from the plaza’s neighboring Triumvirate Environmental, a team from Glastonbury’s Gilbane Construction, the Men’s Club at Temple Sinai, and disc jockeys from Radio 104.1 and The River 105.9. 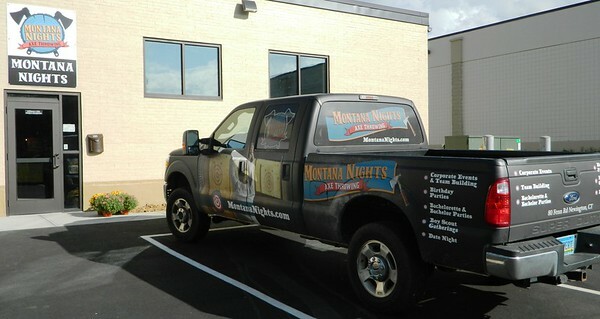 Montana Nights has been the site of bachelor parties, first dates, family gatherings and girls’ nights out. Children ages 10 and up are welcome to join adults in the fun. “We love anything from a couple coming in for game night, to groups of 100 who buy the place out,” Mackenzie said. There are seven pits with two targets each. Groups of 8 to 12 people are assigned their own private pit, while those less than eight may be paired with another group, space-depending. People can book visits for 75 minutes or two-hours at a time. One “ax-pert” is assigned to each pit. They stay with groups for their entire session. On the company’s end, this ensures no shenanigans take place. Safety is priority one. Mind you, the “ax-pert” also works for gratuities. An adult-only league started three weeks ago. Another one is set to begin forming after the holidays. 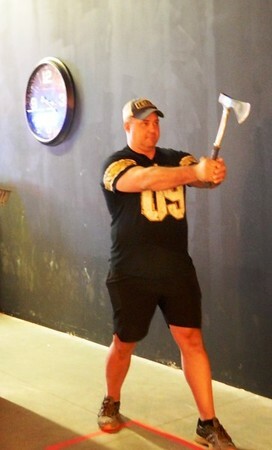 He can’t claim ownership of this coveted and catchy axe-throwing title, but has had trophies designed for winners. Montana Nights Axe Throwing is open Tuesday through Thursday from 4 p.m. to 10 p.m., Friday from 4 to midnight, Saturday 1 p.m. to midnight, and Sunday from 1 to 8 p.m. It’s closed on Mondays.Reservations are advised. (860) 665-9930. Posted in Newington Town Crier, Newington News on Thursday, 18 October 2018 17:15. Updated: Thursday, 18 October 2018 17:17.